First semester: Wednesday 13-15 (room B6), Friday 14-16 (room B6). Second semester: Wednesday 16-18 (room B6), Thursday 11-13 (room B6). Friday, Feb 5th, room E3, 9am-1pm. Friday, Feb 26th, room E3, 9am-1pm. Sep 30th. Introduction to the course (2h), Giorgio Metta -slides (6Mb!!)-. Oct 14th. Analytic examples of direct and inverse kinematics (2h). Ugo Pattacini. -ref, Sciavicco-Siciliano, chapter 2. Example: iCub DH parameters. Oct 16th. Differential kinematics, derivatives of matrices, Jacobian, singularities (2h). Giorgio Metta. -ref, Sciavicco-Siciliano, chapter 3. Oct 21th. Differential kinematics, inverses of Jacobians, redundant manipulators (2h). Giorgio Metta. -ref, Sciavicco-Siciliano, chapter 3. Oct 23rd. Iterative methods for solving inverse kinematics (2h). Ugo Pattacini. - ref, Sciavicco-Siciliano, chapter 3. Note on the use of null space approach to deal with joints bounds (Liegeois). Example: geometric Jacobian of a 3 dof planar manipulator (3.2.1); singularity in the transposed Jabobian of the anthropomorphic manipulator (3.4). Oct 30th. Inverse differential kinematics, statics (2h). Giorgio Metta. -ref, Sciavicco-Siciliano, chapter 3. Nov 6th. Solving an exam exercise (2h). Ugo Pattacini. Nov 11th. Manipulability, Dynamics, Lagrange formulation (2h). Giorgio Metta. Nov 13th. Dynamics, properties of the manipulation models (2h). Giorgio Metta. Nov 18th. Computing the dynamics of a two degrees of freedom planar manipolandum: the Lagrange approach. Francesco Nori. Nov 25th. Dynamics: linearity of the dynamic parameters (2h). Francesco Nori. Nov 27th. Forward and inverse dynamics. Task-space models (2h). O Khatib - IEEE Journal of Robotics and Automation, 1987 -paper-. Francesco Nori. Dec 2nd. Forward and inverse dynamics. Task-space models (2h). Francesco Nori. Dec 4th. Joint space control of a kinematic chain (2h). Francesco Nori. Dec 9th. CANCELLED(2h). Francesco Nori. Dec 11th. PD control with gravity compensation. Inverse dynamics control. Robust control: first part (2h). Francesco Nori. Dec 16th. Robust control: second part. Adaptive control (2h). Francesco Nori. Dec 18th. CANCELLED. Francesco Nori. Jan 22nd. Extra lesson. Computing dynamics of simple 2DOF mechanisms -notes-. Francesco Nori. February 24th-25th. Neural control of movements (4h), Prof. Pietro Morasso -notes1-. March 3rd-4th. Neural control of movements (4h), Prof. Pietro Morasso -notes2-. Perception and Synthesis of 'Shape' - Catastrope Theory, Application of PMP for Imitation, Teaching iCub to draw. Mohan Vishwanathan -notes4 (4Mb)- -Ph.D. thesis-. April 1st and April 7th. Easter vacation. April 8th. CANCELLED (RBCS melting pot day). April 21st. CANCELLED (Hannover-Genoa flight cancelled). April 22nd. CANCELLED (Hannover-Genoa flight cancelled). Read also paper by Poppele & Bosco linked below. Internal models for motor control and trajectory planning. - R. Poppele, G. Bosco. - P. Borroni, M. Montagna, G. Cerri, F. Baldissera. - L. Fadiga, L. Craighero, G. Buccino, G. Rizzolatti. - L. Fadiga, L. Fogassi, V. Gallese, G. Rizzolatti. Visuomotor neurons: ambiguity of the discharge or ‘motor’ perception? - G. Rizzolatti, M. Arbib. - R.C. Miall, D.M. Wolpert. Forward models of physiological motor control. 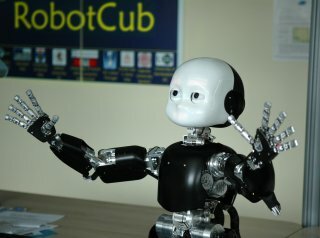 - See the Cognitive Humanoids Laboratory website, the LIRA-Lab and the RobotCub project home page. - Part of the material presented in the second semester was taken from the book "A Mathematical Introduction to Robotic Manipulation" by Richard Murray, Zexiang Li and Shankar Sastry available here -pdf-. - Gazzaniga, M. S. The Cognitive Neurosciences. Cambridge: MIT-Press. 1996. - Kandel, E. R., Schwartz, J. H., & Jessel, T. M. Principles of Neuroscience. Elsevier. 1991. - Yoshikawa, T. Foundations of Robotics. The MIT Press, Cambridge MA, London UK. 1990. ISBN 0-262-24028-9. - Rojas, R. Neural Networks, Springer, 1996. - Arbib, M.A. (1995) The handbook of brain theory and neural networks. MIT Press. - Bernstein, N.A. (1957) The coordination and regulation of movement. Pergamon Press. - Morasso, P., Sanguineti, V. (1997) Self-organization, Cortical Maps and Motor Control. North Holland. - Shepherd, G.M. (1998) The synaptic organization of the brain. Oxford University Press.